Dual Energy enhances traditional x-ray inspection and allows for the detection of materials previously unseen by x-ray or any other conventional method. Dual Energy diverges from regular x-ray inspection as it uses two energy spectrums to discriminate between high and low channel x-rays, as well as a dual-layer detector. Dual Energy x-ray systems bring value added detection features to identify missing product, damaged product, dented or altered packaging and presence of a premium item by discriminating materials by their chemical composition (atomic number). Conventional single-energy x-ray inspection technology has been established as a reliable tool in detecting contaminants like stainless steel, ferrous and non-ferrous metals, glass, calcified bone, mineral stone and high-density plastics and rubber. However, it doesn’t do as well with inorganic contaminants such as glass shards, low-density plastics, rubber or stones and rocks. Inaccurate readings also frequently occur with single-energy x-ray systems when inspecting complex, variable-density foodstuffs. 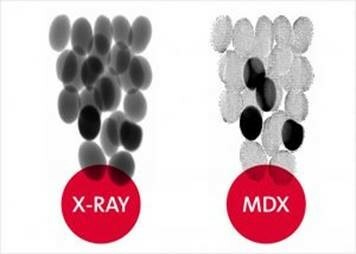 The goal for dual-energy x-ray systems is to run at maximum sensitivity with few to no false reject activity in these applications..
Dual energy inspection gives more detail in the inspection image and is best used for applications that cause ‘busy’ images with varied density distribution. 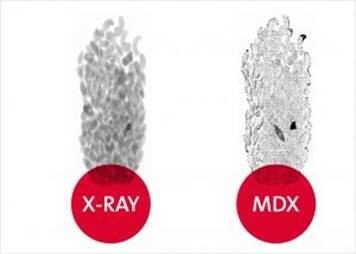 This makes dual-energy x-ray ideal in applications for fruits, vegetables, salad mixes, nuts, cereals and candies, which can be a challenge for standard x-ray inspection systems since they present busy images where contaminants can be difficult to locate.